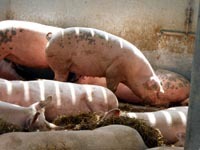 A pig unit should aim for at least 45% of sows to be in parities three to five, as these are the most productive animals. 20–25% of production should be from gilts so it is important there are enough gilts available to serve. To calculate the target annual replacement rate, producers need to decide what the target number of litters per sow lifetime is, ie an average lifetime of five parities. If the farrowing index is 2.33 litters per year, the whole herd turnover is calculated as 5 / 2.33 = 2.15 years. So target annual replacement rate will be 100 / 2.15 = 46.5%. Actual replacement rate is the number of served gilts introduced expressed as a % of the average herd size for the year. Alternatively, multiply the average number of served gilts (% of the herd) by the farrowing index, ie 20.5% x 2.33 = 47.8%. The higher the litters per sow per year and the lower target litters per lifetime, the higher the replacement rate will be. The cost implications also need to be monitored and evaluated. Feel free to contact me directly or comment below if you’d like more information on this.